Front designs are printed pocket size on polos and full size on t’shirts. Except Design 1 (Crest) which is printed pocket size on both polos and t’shirts. Students’ names are printed in one of the following designs. If school crest is required, indicate this on the order form. Classy polos with contrasting side panels. Students’ names on back and design on front. Cotton 35% Polyester 65%. Priced from $35. Select a design for the front and back of your shirts. 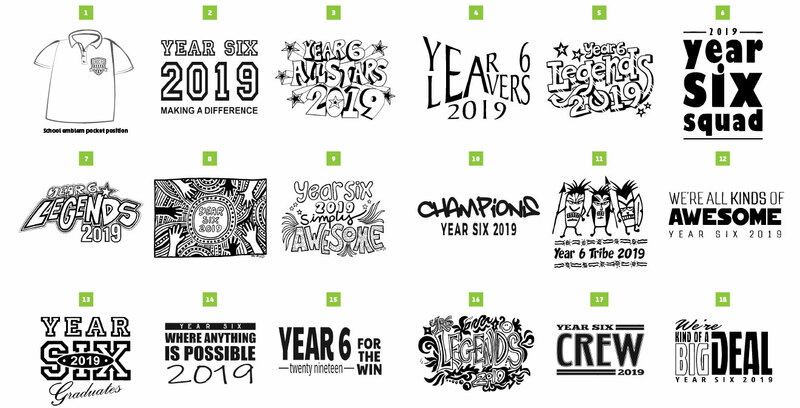 The names of all your Year 6 students and teachers will be inserted into the design. Alternately you may supply your own design drawn with black felt pen on white A4 paper, ensuring no colours or pencil lines are visible on your artwork. Use the size guide on our Order Form to help you select the right size. The ‘TO FIT CHEST SIZE’ is the student’s chest measurement, not the size of the shirt which is larger. Our shirts are the same size as previous years so your existing samples will be fine. Please phone if you do need samples and we will send two popular sizes. Everything you need to know is on the Order Form. Use it to gather and collate information then order online. Delivery time is a lightning fast 3 weeks. 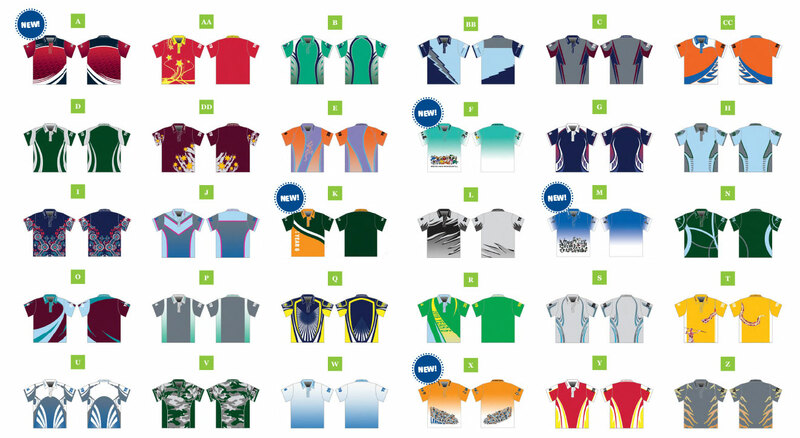 Apply your favourite colours to our awesome LAYOUTS to create a truly unique and vibrant Year 6 shirt. You can see exactly how they will look using our ONLINE DESIGNER. Select a design for the front and back of your shirts. 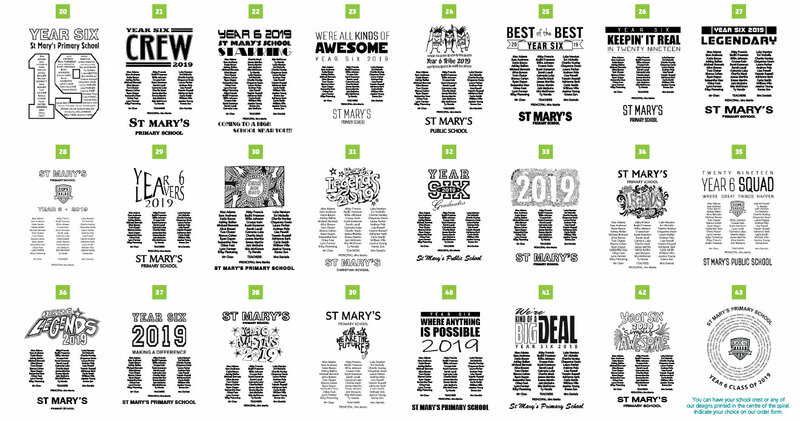 The names of all your Year 6 students and teachers will be inserted into the design. Alternatively you may supply your own design drawn with black felt pen on white A4 paper, ensuring no colours or pencil lines are visible on your artwork. Colourful templates, students’ names on back, design on the front, words in sleeves and polo collar. Use the size guide on our Order Form to select the correct size. You can find out everything you need to know on the Order Form. Delivery time is 6-8 weeks. We think the teachers & organisers should get their shirts for free so we will give you 4 free shirts for orders over 80 shirts, 3 free for orders of 40 to 79 shirts, 2 free for orders of 20 to 39 shirts and 1 free shirt for 10 to 19 shirts.